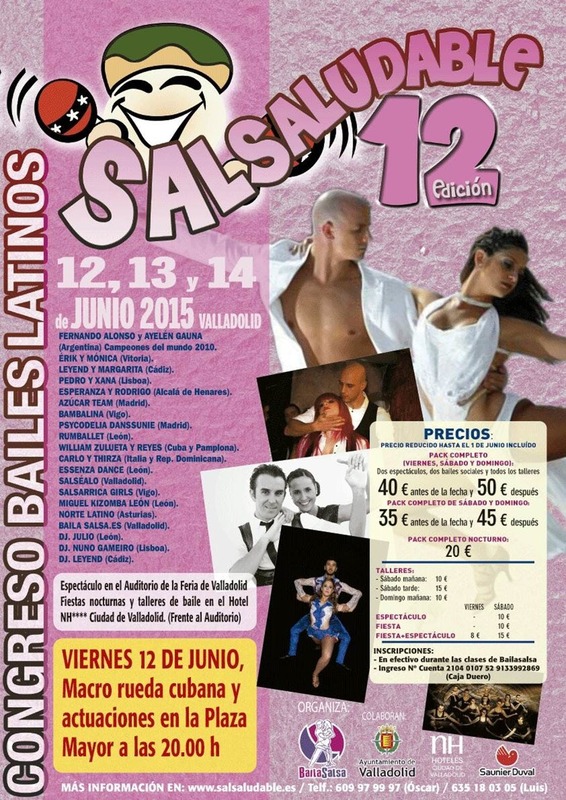 12, 13 and June 14, 2015 in Valladolid will have a new edition of SALSALUDABLE, one of the conferences most traditional Latin dances of Spain, a pioneer in bringing world champions Castile and Leon. In this issue we continue to work on the line of promoting social dancing, shows in great facilities and planning workshops tailored to participants. We continue on the premises of Hotel NH Ciudad de Valladolid **** facilities where we will hold workshops and social dances. Specifically in two rooms over 450 square meters, with polished, bright and air-conditioned floor, a perfect place to teach workshops and enjoy social dancing place. Regarding the show on Saturday 13, it will be held in the Auditorium of the Feria de Valladolid, opposite the Hotel NH. On workshops, plus workshops BACHATA SENSUAL, SALSA, cha3 ....... We will again have a line of Semba and Kizomba workshops. We maintain our traditional opening of Salsaludable in the main square of Valladolid with presentation ceremony, Cuban macro wheel, animations, social dancing, etc. We have a poster of dancers in which new faces present at the event traditionally artists come together. You can buy your ticket in g & dance. If anyone has bought the ticket and eventually unable to attend, the full amount before the event to return Sunday, June 7, after that date the return will be 75% of the total. And on Sunday 14, THE MOTHER OF ALL PARTY, PARTY CAMPERA. If you come to any of the previous editions, you can not miss the atmosphere that you know and if you've never been, not to be missed. SALSALUDABLE 2015, the number twelve.